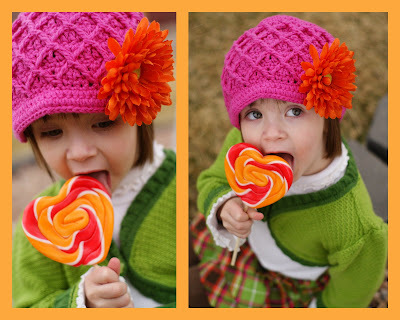 Mmmmm, lickable cuteness. Mia wore this outfit at church. 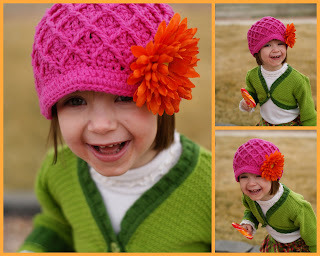 I am delighted with the bright colors and Mia's cute antics. Te he he heeee. My little taste of spring is more than I can contain! Ahhhh, Saturday was ah-mazing! The temperature soared to nearly 60 degrees, bliss! We packed up the kids picked up Ella and went to the park for two hours of fresh air. Alison, Matt, and boys all went to watch a fly fishing documentary produced by a local friend. We took Ella to save her from sitting for two hours. Mia helped Justin make sandwiches for everyone before leaving. I packed up the rest of lunch and once Phillip woke up from his nap we set off. 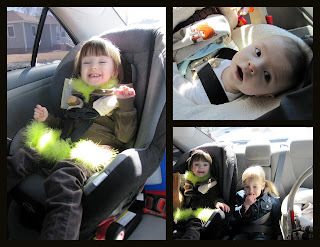 Justin put on his man scarf so Amelia had to put on her scarf too...it happened to be a bright green boa, tucked into her jacket. 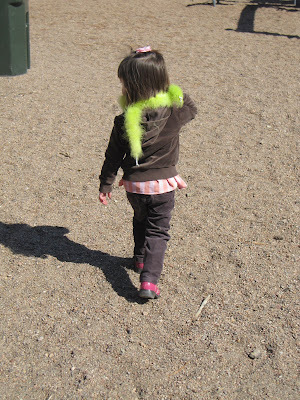 She had me in stitches watching her run all over the playground with her boa flapping in the wind. Two other families from our ward also showed up so the girls had plenty of playmates. 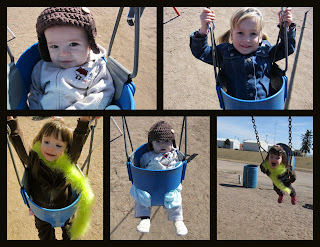 Phillip had his first ride on the swings. At first he was not very sure about it but then decided it was delightful. Me, I felt freed from winter's grasp in the breeze and sunshine! 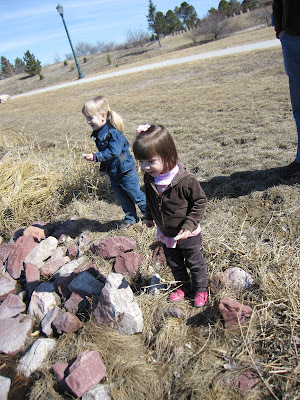 We fed the geese then walked around the pond path. Once we left I still felt starved for sunshine so we had a tea party in our side yard. 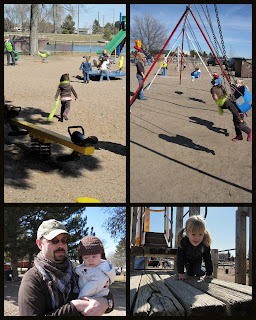 The rest of the day permeated with the lasting effects of fresh air. We went to Cabela's after dinner to look for either a smoker or a set of cast iron cookware. A couple times per year Cabela's offers their employees one item at cost, this time we invested in a smoker. I can't wait to try it out. Is first and foremost the development of skills necessary for a productive and fulfilling life. The best of the academic curriculums are...[of little value] if the child does not develop inner discipline, integrity, and respect for others and oneself. A child is taught certain "works" or activities based on a prinicple after the work is completed the activity is not done until after clean up. Daily Life Activities--I will demonstrate a couple of these activities, be creative in making up your own steps! Toddler stands at sink, gets hands wet, turns off water, soaps up, scrubs hands, turns water on, rinses, then dries hands. Clean up involves cleaning water spots and drying sink with towel. I usually let Amelia wash her hands 2-4 times in a row using the same steps. Toddler stands at sink with a toothbrush, cup, paste, towel, and sticker book ready! She begins by rinsing her brush, opening the paste and spreading a little on her brush. We have a little jingle to brush to: first the front, then the sides, open wide, top, then bottom, swish and spit, last of all our tongue we get. Clean up and paste spills and water spots. to prepare for this activity color different types of pasta using rubbing alcohol and food dye. Use a ziploc bag, pour a tsp of alcohol and a couple drops of dye, add about a half cup of dried pasta, shake bag until pasta is fully colored. Place the colored wet pasta on a couple paper towels and dry over night. The activity is completed by putting all the pasta into one bigger bowl. Place a bowl per shape or color around the big bowl. The object is for the toddler to correctly sort the pasta by shape and or size. Clean up includes putting pasta back into big bowl and putting away as directed by an adult. Stacking bowls and putting in sink. May include some sweeping or vacuuming. Put a variety of colored pom-poms into one big bowl. 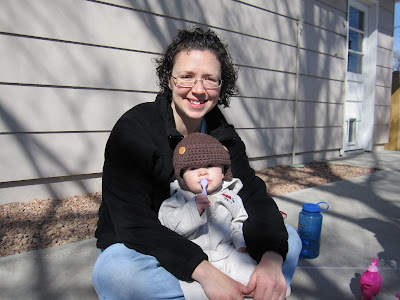 Give toddler a large clothes pin, tongs, or spoon. 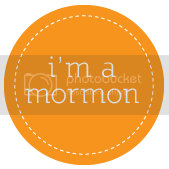 Objective is to transfer a pom-pom using a lever tool from the large bowl to a smaller bowl based on size and or color. I usually do this activity first by size, then by color, then by size. Clean up pom-poms. 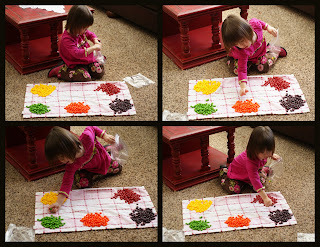 Get a large bag of skittles, pour bag in middle of a towel, sort the skittles by color into piles. You can stop here. We also sorted the separated colors into small baggies with one of each color per baggie. Took a lot of baggies but it was fun and then we had 60 small baggies full of small sugary snacks that will last us 60 snack times!!! Say colors out loud. I keep some of my colorful yarn cuttings (larger than 4 inches) for Amelia to play with. Once I have collected a pile of 10-15 strands we do this activity. I put the different color strands into a central pile. I empathsize over and over that scissors are only used when Mommy is near and on paper and yarn. Cut yarn into different lengths. We sort the yarn sizes into approximate length piles. Set up a pitcher of water that the child can lift, array a spread of different sized containers, all on a towel (or three). Let the child slowly pour the water into one container until half full. Then pour the water in the new container into a smaller or larger container. Continue to pour water until the pitcher is empty. Make observations with the child, noting how water conforms to the shape and size of the container. Cut 2-3 cheap sponges into different shapes (squares, triangles, circles, stars, etc), fill a medium bowl with about an inch of water, have an empty bowl ready to squeeze the sponges into. 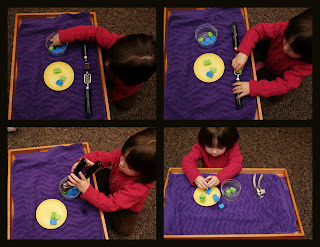 As child chooses a sponge have him/her identify the shape, squeeze all the water out of sponge into the empty bowl. Continue until the first bowl is empty. Switch bowls and have the child repeat. I also have cut a sponge until small 1/2 inch rectangles. Amelia puts a wet sponge into a garlic press and uses the tool to squeeze water into a separate bowl. Prepare an empty pot, have child fill pot with dirt, plant seed, and water. Explain while you work that the seed will take time to grow and that it needs sun, water, air, and dirt to grow. 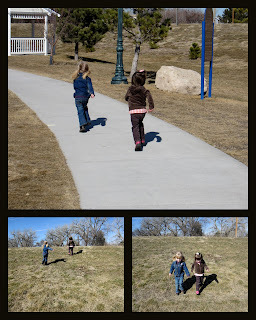 We do this activity outside or in a large space. I make a list of 10-15 animals then show Amelia how to act like the animal with my voice and body, she copies me once I am done. Very fun to do outside when you want to burn some calories!!! Skills learned include sharing, tool manipulation, cause and effect, following rules. I have two rules: 1. no throwing rice 2. rice stays on the blanket. If these rules are violated the rice is immediately put away. To prepare get a large amount of rice, wash it to remove rice flour, you can also color rice using rubbing alcohol, food coloring, and a gallon bag. Pile the rice into the middle of a large blanket or length of fabric, arrange cups, plates, funnels, spoons, etc around rice. Let the toddlers play! Clean-up together! make 4-6 (large) lego towers, place at one side of the room, get a ball and roll to knock over towers. 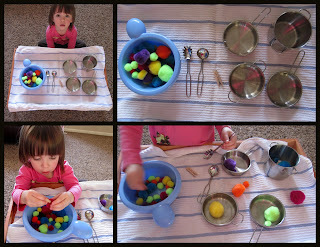 Shaker jars used to put soft and loud items in (like beans, metal washers, pom-poms, etc) then have toddler tell you if the object is loud or soft.